Example results. Sink vertices are marked in red. The coverage range is two edges wide. The distance values of active half-edges are colored (see legends for color ranges). Boundary edges are excluded from the calculations. We forbid deadends and edges that are too close to each other. (a) to (c): A typical urban layout scenario such that all boundary vertices are sinks. 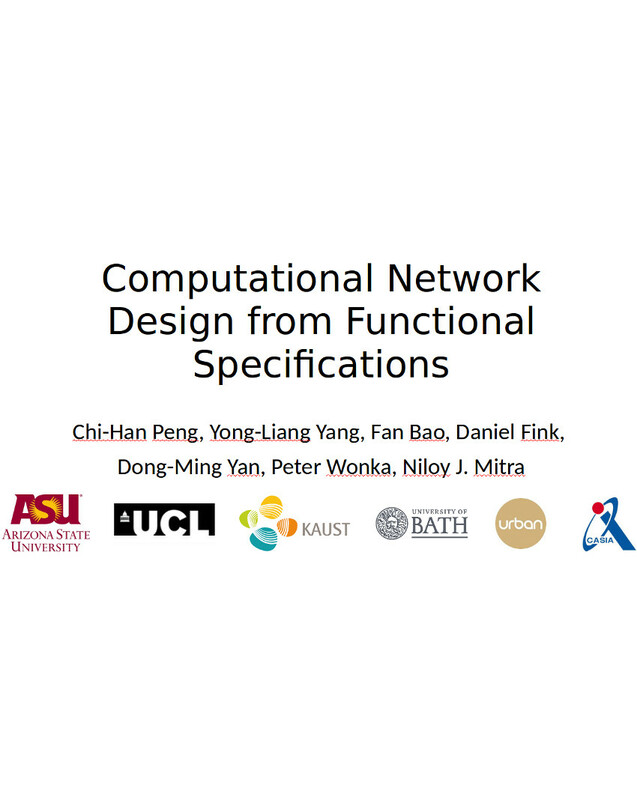 The first two use different weights to optimize for (a) numbers of network edges and (b) sum of distance values. Note that we do not specifically constrain the maximum distance values. (c): A result that also optimizes for distance values but with the point-to-point constraint enabled (sampled vertices are marked in yellow). (d): We now constrain a boundary vertex (top middle) to be the sole sink. (e) to (g): A typical floorplan scenario such that a few inner vertices are sinks (e.g., elevators). Similarly, they differ by different relative weights and whether the point-to-point constraint is enabled. Pipeline. For each sub-region, as determined by the input major roads, we generate layouts in three levels of decreasing coverage ranges. For each level, a rough street network is first generated by the IP-based approach (shown in gray). Afterwards, the geometry of the generated street network is refined by a smoothing process. Dead-ends are typically allowed only at the last level. Optimization results with changing λL (to minimize network lengths) versus λD (to minimize travel distances). A larger λL leads to shorter network lengths but longer travel distances, while a larger λD leads to the opposite. 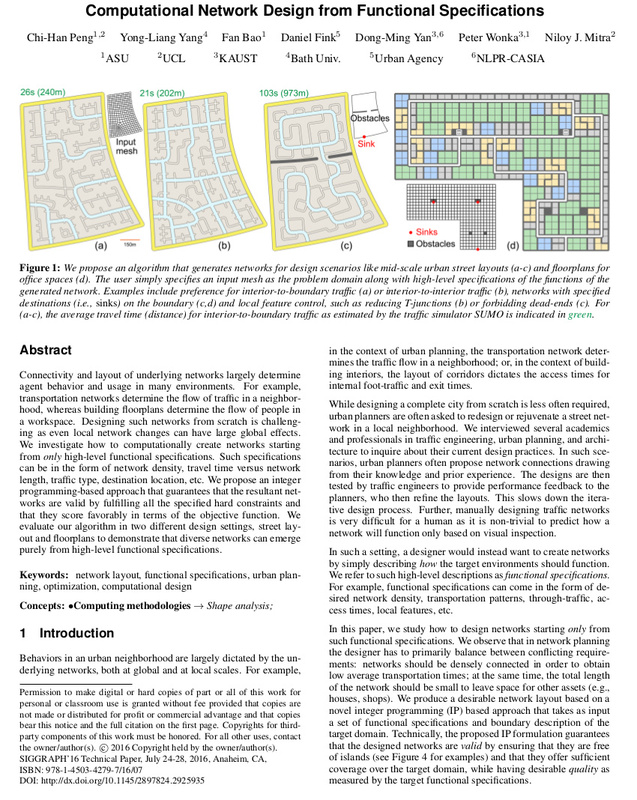 Case study: Various scenarios created using functional specifications (see paper for details). L denotes the total street length in meters, d the average travel distance for specified traffic demand, and SUMO indicates the average travel distance per the SUMO traffic simulator. The color-coded street network shows the traffic distribution over different road segments (gray indicates no traffic). 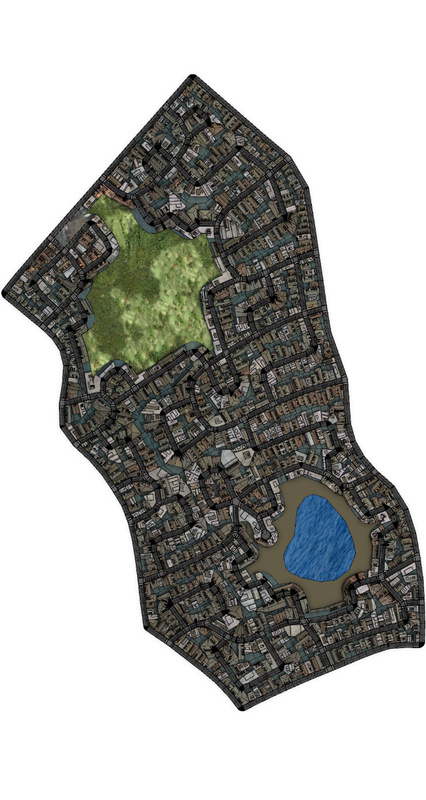 Parcel and building layout using CityEngine based on street layout in (g) on the left. Note that since our algorithm ensures that the streets are appropriately spaced parcelling for the buildings remains a simple task without requiring any street modifications.